Will states make access to it more difficult? 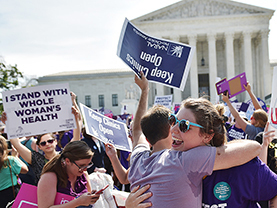 Abortion-rights advocates won a major victory in June when the Supreme Court struck down a Texas law requiring doctors to obtain permission to practice at hospitals near their offices and to have abortion clinics adhere to hospital building codes. Legal experts believe the ruling may slow the spread of efforts nationwide to restrict abortion. During the first half of 2016, 17 states passed 46 separate restrictions, ranging from lengthening waiting periods to banning abortions after 20 weeks. However, anti-abortion activists have vowed to pursue other restrictions. With emotions likely to remain high, the presidential candidates’ stances on abortion could mobilize voters in November. Republican Donald Trump is promising to nominate Supreme Court justices who will oppose abortion rights, while Democrat Hillary Clinton is pledging to uphold those rights.